Many people are great believers in the principle of natural healing or nature cure. They feel that for all our ailments or injuries, leaving them for nature to act and heal is the best policy. These days, if any of our near or dear once gets a fever, there is a rush to see a Doctor and see that he prescribes the strongest medicine, preferably an antibiotic, so that the fever is cured as fast as possible. With injuries, not much can be done but here again we try to do things that can speed up the healing process. I don't see anything wrong in this, as compared to past, we face today much larger variety of pathogens and viruses that can cause infections and be very harmful to us. Those who believe in natural healing feel that since the pathogens and viruses have been created by nature, it has also given to the living organisms, ways of fighting them. All we have to do is be patient; nature would take it's own course. If nature can heal the humans, why not extend this logic to natural disasters. Every year we hear news of hurricanes, twisters, typhoons and cyclones that destruct thousands of square miles of once prosperous lands. We have earth quakes and volcano eruptions, tsunami waves, floods caused by cloud bursts that destroy human habitats, sea coasts, hill sides. The list is endless. Why then there is no nature cure for these kind of disasters, so the landscapes can recover or regain its past? Surprisingly, this is what has been observed recently by geographers on an island in the Pacific ocean. The Marshall Islands, is an island country located in the northern Pacific Ocean. Geographically, the country is part of the larger island group of Micronesia, with the population of 68,480 people spread out over 24 low-lying coral atolls, comprising 1,156 individual islands and islets. Historically speaking, from 1946 to 1958, US tested 67 nuclear weapons in the Marshall Islands including the 1952 test of the first U.S. hydrogen bomb. Micronesian islands are spread over a large area and are separated by sea. Mile or Milli island is one such island that is located towards the south, but is actually an important member of the Marshall island chain. 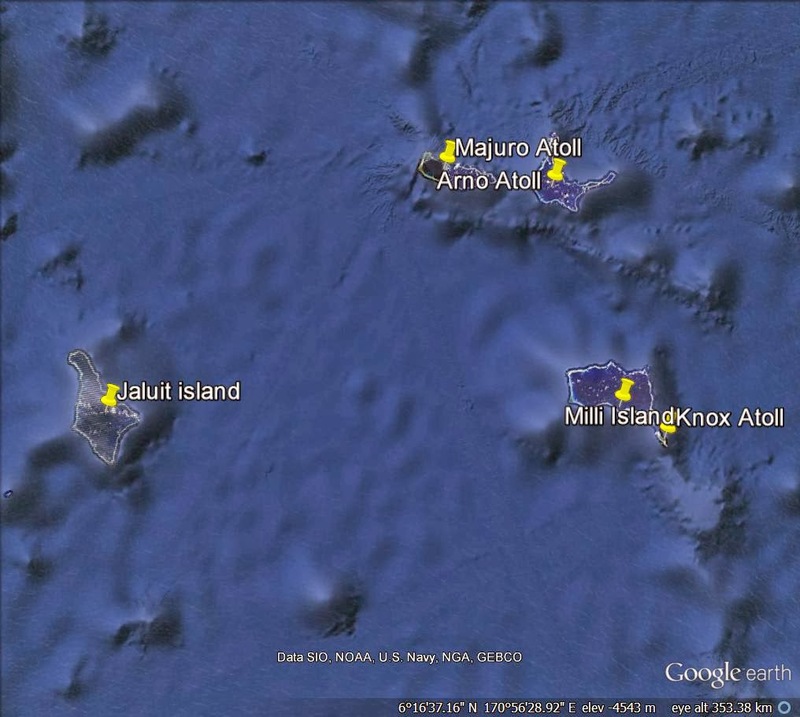 South of this island lies a tiny sea washed landmass consisting of 18 islands known as Knox Atoll or Nadikdik Atoll. The total land area is only 0.98 square Km, but it encloses a largely sand-filled lagoon with an area of 3.42 square Km. 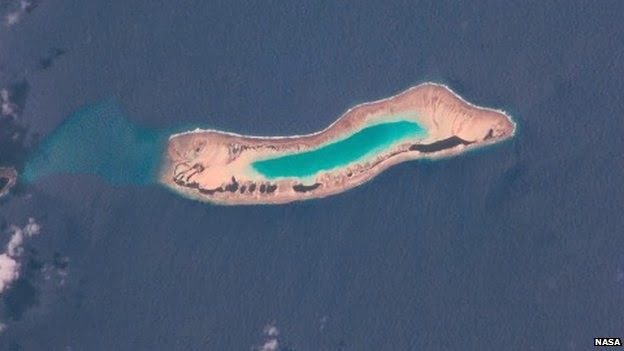 The atoll measures 11 Km in length and is 2 Km wide. Majuro were devastated by a huge typhoon on 30 June 1905. In fact, Nadikdik Atoll was completely washed over by the Typhoon that stripped the atoll down to the bare coral. All of its 60 inhabitants perished, save two boys, who survived a 24-hour drift voyage clinging on a breadfruit tree. Surprisingly, the destruction by the Typhoon is slowly getting healed by the nature herself as per a report published in Auckland based 'The New Zealand Herald,' quoting Dr Murray Ford of the University of Auckland. It says that the 1905 typhoon had washed away most of the island's landmass. But the islands seem to have re-established themselves - one has become a fully vegetated, stable island again - while several smaller islands have reappeared and formed into a single, larger landmass. The University of Auckland study has been published in the journal Geomorphology and highlights the continuous changes that are taking place dynamically in the island systems of the Pacific, over relatively short periods of time. Dr Murray Ford and Professor Paul Kench of the University, have been investigating the changes that have taken place since 1905 on the southern Marshall Islands. 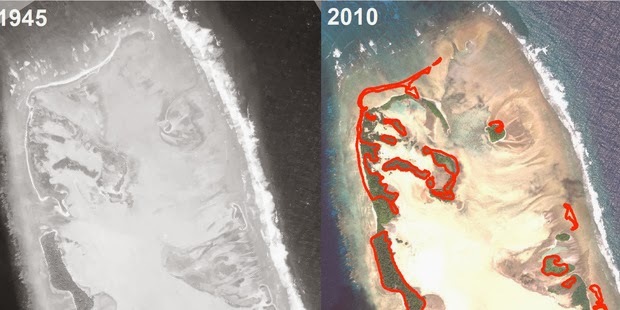 Aerial images of the island have shown significant recovery between 1945 and 2010. Dr Murray feels that a high magnitude event like a typhoon that had destroyed the islands also set about a series of processes, that has enabled them to return. Isn't this something that just works like the principle of natural healing or nature cure, that people believe can cure our bodily ailments. Who can say Natural healing does not work?